An unexpected phone call turns the life of a construction foreman upside down. Construction foreman Ivan Locke (Hardy) has just finished a day's work, and is about to drive home to watch the footy with his wife (Wilson) and two sons (Holland and Milner), when he receives a phone call that scuppers his plans. Seven months earlier, Locke indulged in a one night stand with a lonely work colleague, Bethan (Colman), who is now about to give birth to his son two months premature, denying Locke the luxury of time to explain the situation to his wife. Estranged from his own absent father, Locke vows to do the right thing and sets off for the hospital, a two hour drive away in London, knowing his decision may cost him both his family and his career. Steven Knight has previously cornered a niche in UK cinema with a series of screenplays examining the various ethnic groups that form today's multicultural Britain; Nigerians and Turks in Dirty Pretty Things, Russians in Eastern Promises, Muslims in Closed Circuit and the Chinese in his directorial debut Hummingbird. His sophomore directorial effort is quite a departure then, with the face of a white Welsh male the only one visible throughout the film's tight 85 minutes. That face belongs to Tom Hardy and is no longer obscured by a mask as it was in his previous film The Dark Knight Rises. That movie called upon him to be no more than a big lug but here his acting ability is given a stern test, and it's a challenge he takes on with relish. In the hands of a lesser actor, Locke could have been little more than a glorified radio play with an accompanying slideshow, but Hardy's subtly expressive face is a special effect no amount of CG could rival. For several years now, the British actor has been garnering rave reviews but aside from the over-rated Bronson and the under-rated Warrior, we haven't seen him awarded too many substantial roles. Locke could be the meatiest role Hardy ever lands, and he tears into that meat like a starved Tiger. That's not to say his performance is showy, quite the opposite. Indeed, there are few movies less showy than Locke. Knight's script is based around two dramatic sub-plots: Locke's desperation to do right by his about to enter the world son and his professional obligation to ensure a building project (Europe's largest ever commercial concrete pour) goes off without a hitch the next morning. 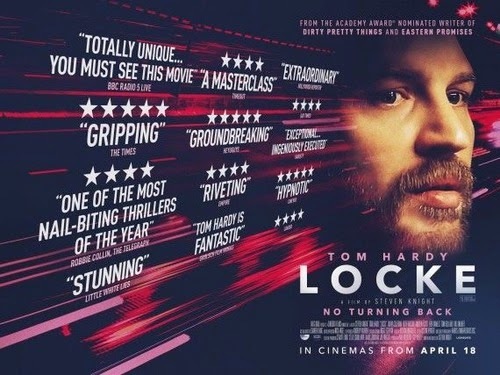 On paper, neither strand seems particularly interesting, but Knight, Hardy and the ensemble of voice actors make Locke as gripping as any far-fetched thriller. The title character is a quiet, rational man who solves his problems in a calculated, scientific manner. As he struggles to put out the various fires his actions have created, we quickly empathise with this rational man trapped in an irrational world. The mother of his child, high on anaesthetic, repeatedly asks him if he has any feelings for her, but Locke refuses to be drawn into such a drama, coldly, but sensibly, replying "I don't really know you, how can I feel anything for you?" Locke's world is all about the minute details. The one moment in which his calm exterior cracks comes when the Irish colleague (Scott) he's reluctantly put in charge of the concrete pour asks if a small amount of C5 grade concrete could be added to C6 grade. Locke explodes, hammering home how one small error could result in the collapse of a 55 storey building. When his boss repeatedly reminds him he's throwing away 10 years of impeccable work through his current actions, Locke calmly corrects him, "It's been nine years." Don't let its minimalist premise turn you off. Locke is a film that immediately draws you into its intimate drama of high grade cement and rogue sperm, and holds you for the entire journey.